Visit Bone Creek Museum 4-5 p.m.
David City Auditorium for Dinner, Dancing and Storytelling 4-8 p.m.
Marvin J. Mohler, 93, of David City, NE died Monday, July 10, 2017 at the Butler County Healthcare Center in David City. He was born May 18, 1924, on a farm near Linwood, Nebraska, to Harry and Mayme (Keller) Mohler. He attended school in Octavia and David City, graduating from David City High School in 1941. He took a test as a 7th grader and did so well he was able to skip a grade to get into high school a year early. On August 15, 1950, Marvin married Patricia (Pat) Pollard. They were blessed with two sons: Mark of David City, Nebraska and Richard “Bodine” (Teresa) of Lakewood, Colorado; and three daughters: Geri (Bob Fry) of Sacramento, CA; Susan Marie of Hailey, Idaho; and Peggy (Tom Neary) of Westlake Village, California. After Marvin graduated, he worked at the Mead, NE bomb plant before joining the Navy during World War II from 1943-46, serving on a ship as an inventory clerk in the South Pacific. As a result of his service, Marvin was awarded a Quilt of Valor that was presented to him in January 2017. He was a member of the “Last Man Standing” club, a group keeping track of WWII vets in this area. He was one of the last remaining of 135. Soon after returning from the war, Marvin met Pat, in Schuyler. After they married in 1950 they lived with his parents outside of Octavia, Nebraska for a couple of years with their first son, Mark. In 1953, the family moved to David City and lived in an apartment above the old Hinky Dinky store on the northeast side of the square. After their first daughter, Geri, was born, they bought the house on 4th Street where Marvin lived until he died. In the 50’s, Marvin began his plumbing business, M&M Refrigeration and Plumbing, with Harold McElravy. They successfully operated this business for 50 years. After retiring when he was 80, the M&M building went on the market, was purchased by Allen and Anna Covault in 2007 and renovated to become the world class, nationally recognized Bone Creek Museum of Agrarian Art. The Mohler family has supported the museum in many ways since its inception, tied to the memory of the place and its significance to the family and the community. Marvin was a traveler. A huge Nebraska football fan, he attended many games in person on the UNL campus and made numerous excursions by bus, plane and automobile to stadiums and bowl games all across the country, usually with Pat, but often with other close friends. Most of Marvin’s immediate family lived out-of-state with their families, but The Mohler Clan (as they call themselves) held reunions regularly with up to 85 Mohlers from all over the country, so the entire family has experienced lots of travel and many shared memories in amazing locations such as: Copper Mountain, Estes Park and Crested Butte, Colorado; Albuquerque, New Mexico; Flathead Lake and Swan Valley, Montana; Smith River, California; Depoe Bay, Oregon; German Town, Wisconsin; Fort Robinson, Niobrara, and Mahoney State Parks in Nebraska and Camp Moses Merrill in Butler County. The most recent reunion was held at Mahoney just three weeks before Marvin passed. 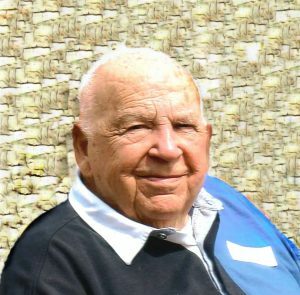 In addition to family and football, Marvin loved watching other Nebraska-related sports, crossword puzzles, singing, dancing, whistling, having fun with friends of all ages, lying in the hammock or sitting on the deck with Pat as the traffic passed by on Highway 15 and watching the thunderstorms roll in, and exploring country roads—even in Butler County, where he lived the majority of his life, these drives were still full of adventure and enthusiasm. He was also a member of the VFW in both David City and Schuyler. Marvin is survived by his 5 children; 7 grandchildren: Eric and Luke Marshall (Geri); Patrick, Matthew and Marie Mohler (Bodine); Owen and Alice Neary (Peggy); and 1 great-grandchild, Rivers (Eric), as well as his sister, Donna, of Cedarburg, Wisconsin. He was preceded in death by his parents; his wife, Pat; brothers Orville, Lester, Gordon, Roy, and Melvin, and sisters Marie, Alice, Bertha, and Ruth. Marvin’s ashes will be united with his wife’s and interred at the Edholm Cemetery—about 100 yards from where he was born on Highway 12A near Linwood. They would have been married 67 years, which is why we chose this date for the celebration.